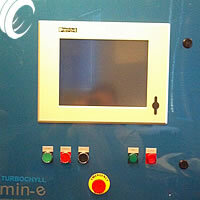 Welcome to TURBOCHYLL min-e, the Aftermarket Industry's advanced choice Electric Chiller Control platform. 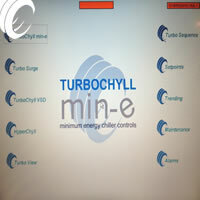 TURBOCHYLL min-e is small on size but not on power. Fully integrated with an onboard Program Card Processor (PCP) and powerful ifm efector field sensing elements, this package was developed in compliment to the proven performance and demand of the (larger) TURBOCHYLL LEEF Steam Operating System. Here too, the PCP by design, maintains the TURBOCHYLL's coveted "software program" which fits neatly on a front loaded 2GB Compact Flash Card. The min-e maintains uniquely powerful control strategies for all high or low pressure chillers including "realized" TPS Surge Avoidance, Part Load and Part Lift- Variable Speed Logic as well as wide range analog Energy Demand. Provided with a front end accesible PID loop menu, you can be assured absolute ease in tuning, gain and fine resolution local settings without complex laptop consideration. The min-e is STANDARD fit to function on ANY chiller or motor starter. 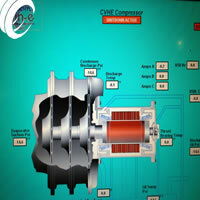 With "built in" full screen color graphics to meet your every application, there is nothing left unanswered. 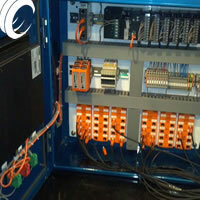 The TURBOCHYLL min-e Control Cabinet is manufactured with the finest industrial "zero screw" components available and runs exclusively on safe Low Voltage 24VDC. Here you will find the brilliantly simply Swivel Docking Blocks, CPU and front loaded Program Card Processors as well as the Front Panel Mounted Graphic Controlled Color 15" Human Interface Display. The Field Mounted Sensors are critically immersed into the varying fluid streams and each maintains LED readouts of pressure and temperatures for convenient operator inspection. No longer is there the need for leaky old mechanical gauges and unacceptable refrigerant gas emmisions. Final fit of The TURBOCHYLL min-e system includes exclusive retrofitting of old, absent or antiquated step controllers with fine resolution analog actuators, motorized valves, compressor vanes controllers, and analog solenoids. The TURBOCHYLL family of end devices offers field fit, carriages, distill tanks, linkages and the like for a perfect final fit of your Electric Chiller Control System! Of course, here too installed and supported with the same meticulous and painstaking care of devlopment by our ICACS field service engineers!